If you keep up with Christian publishing for any length of time, you will eventually spot a curious phenomenon. Every now and again a scholarly book will show up and a lot of people will get really excited about it. It will be a book that, under normal circumstances, would be known among only the scholars. And yet this one will be released with accolades assuring the non-scholarly readers (like me!) that they, too, can benefit from it. 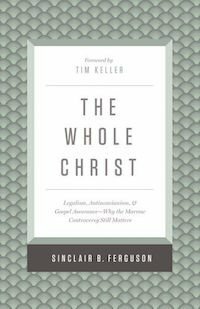 This year’s first such book is Sinclair Ferguson’s The Whole Christ: Legalism, Antinomianism, and Gospel Assurance—Why the Marrow Controversy Still Matters. It has received those accolades and, just like they say, it is definitely worth the read. This was the starting place for the Marrow Controversy, but as the controversy unfolded it unearthed a whole host of related issues. The Whole Christ navigates them through “an extended reflection on theological and pastoral issues that arose in the early eighteenth century, viewed from the framework of the present day.” In other words, Ferguson looks at this controversy, dissects it, and then applies it to our day. And, as it happens, we, too, are struggling with issues related to legalism and antinomianism. That makes his book perfectly timed and a valuable contribution to the discussion about the role of the law, the role of obedience, in the Christian life. This is a book full of treasures. Some of the treasures are on the surface waiting to be picked up, among them Ferguson’s one-line summaries of great truths: “It is misleading to say that God accepts us the way we are. Rather he accepts us despite the way we are” and “antinomianism and legalism are not so much antithetical to each other as they are both antithetical to grace.” Many of the other treasures yield only to care and effort, and in this way the book demands a fair bit from the reader. I suspect I would need to read it through once or twice more to have an advanced grasp of its subject matter. I would like to go back and do that very thing. Book Review – Who Are You To Judge?